These ads are arranged chronologically with the earliest ones first. Full color 9 1/2" x 12" ad for their King Size Filter Cigarettes with a Refreshing Hint of Mint. The ad has a picture of a man who is swimming in a calm, blue body of water. He is holding onto the rocky shoreline and a lady, who is sitting on a large rock, is passing a cigarette to him. The ad headline claims that Newport "Refreshes while you smoke!". This ad is larger than my scanner bed so the outer edges of the ad will not be visible in the scanned view. Full color 10" x 13 1/2" ad for their King Size Filter Cigarettes. This ad has a picture of a couple relaxing near the ocean and each smoking, and enjoying, a Newport Filter Cigarette. The area they are enjoying has a combination of sand and rocks and the water is visible through a rocky overhang. 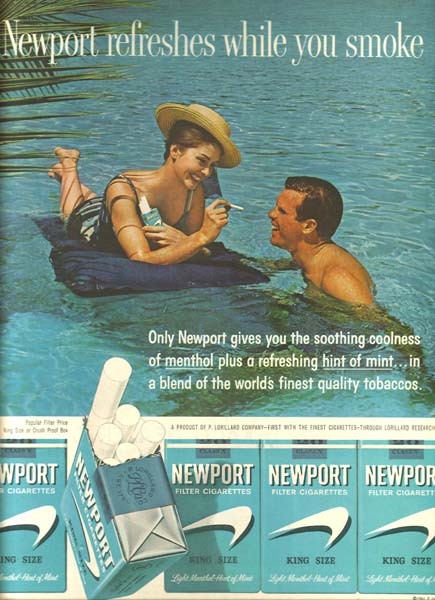 The ad reminds us that "only Newport adds a refreshing hint of mint to the soothing coolness of menthol and the ocean-breeze freshness of super-porous Micropore paper". Full color 9 1/2" x 13 1/2" ad for their King Size Filter Cigarettes. This ad is another one of the series that shows a happy couple frolicking in a rocky lagoon. There is a rock that is surrounded with water that happens to be nearly the same color as the packs of Newport shown below and a woman wearing a striped robe with the same shade of blue-green sits alone on this rock. She holds a pack of Newport and is handing one to a man who seems to have swum out to the rock. The headline claims that Newport "Refreshes while you smoke...like no other cigarette" and the text reminds us of the refreshing hint of mint and the coolness of menthol. Full color 9 1/2" x 12" ad making the claim that Newport "refreshes while you smoke...like no other cigarette". The ad has a photo of a man floating in a lake with his hands on the edge of a white boat while a woman, who is sitting in the boat, leans over and lights his cigarette with the one in her mouth. The text claims that "Only Newport adds a refreshing hint of mint to the soothing coolness of menthol...in a blend of the world's finest quality tobaccos" and mentions that, as of the year 1960, the P. Lorillard Company had acquired two hundred years of tobacco experience. Full color 9 1/2" x 12" ad for their King Size Menthol Cigarette with a hint of Mint. The ad has a picture of a couple splashing through a lagoon while they smoke their Newports. The ad headline claims that it "Refreshes while you smoke...like no other cigarette!". This ad is larger than my scanner bed so the outer edges of the ad will not be visible in the scanned view. Full color 9 1/2" x 12" ad for these Menthol Filter Cigarettes with a Hint of Mint. The ad has a picture of a couple enjoying the peace and quiet of a secluded beach on a still day. The man is squatting down in the water while the woman, wearing a blue striped bathing suit, is lighting the cigarette that he holds in his mouth with hers that she holds in her right hand while her left is filled with sun tan lotion and a towel. The ad headline claims that "Newport refreshes while you smoke". Full color 10" x 12" ad with a photo of a lady floating on a blow-up raft on some tropical still waters while she holds a Newport cigarette in one hand and the opened pack in the other. She is talking to a gentleman who is treading water next to her. The ad headline promises that "Newport refreshes while you smoke". This ad is larger than my scanner bed so the outer edges of the ad will not be visible in the scanned view. Full color 9 1/2" x 12" ad for their Light Menthol Cigarettes with a Hint of Mint. The ad has a picture of a very blue body of water with tropical trees around the edge. There is a small white skiff floating in the water with a couple standing next to it and holding onto it as the woman lights the cigarette in the man's mouth with the cigarette that she has already lit. The ad headline claims that Newport "Refreshes while you smoke". This ad is larger than my scanner bed so the outer edges of the ad will not be visible in the scanned view. Full color 9 1/2" x 12" ad for their King Size Filter Cigarettes with Light Menthol - Hint of Mint. The ad has a picture of a couple that have been scuba diving along the edge of a rocky seashore. The man, with his mask pulled up, is floating in the water and accepting a lit Newport from the woman who is sitting on a rock with her mask pulled up. The ad headline claims this cigarette is "More refreshing to begin with...More refresshing all the way". This ad is larger than my scanner bed so the outer edges of the ad will not be visible in the scanned view. Full color 9 1/4" x 12" ad for their King Size Filter Cigarettes. This ad has a photo of a couple in bathing suits sitting on some rocks that overlook the ocean. The man is holding a movie camera and has an unlit cigarette behind his ear and the lady is holding the pack of Newport that his cigarette came from while smoking one of her own. The ad headline claims that "Newport refreshes while you smoke" and the text assures you that "Only Newport gives you the soothing coolness of menthol plus a refreshing hint of mint...in a blend of the world's finest quality tobaccos"..
Full color 9 1/2" x 13" ad for the King Size Filter Cigarette with the Cool taste. There is a refreshing picture of a couple sitting on the rear of a small white sailboat as it floats in a lagoon filled with clear, blue water. There are both smoking Newport cigarettes as the lady laughingly hangs her legs over one side into the water and the man sits on the other side to counterbalance her weight. The ad headline claims this cigarette is "More refreshing to begin with...more refreshing all the way". Full color 9 1/2" x 12 1/2" ad for the cigarette that refreshes. The ad has a picture of a couple enjoying the blue water on a beautiful day. The man has been snorkeling and has popped to the surface where his lady is waiting with a lit Newport cigarette in her hands. The ad headline claims that "Newport refreshes while you smoke". This ad is larger than my scanner bed so the outer edges of the ad will not be visible in the scanned view. Full color 9 1/2" x 12 1/2" ad for their King Size Filter Cigarettes with a Hint of Mint. The ad has a picture of a body of blue, cool water where a lady is sitting on a rock that stands a couple hundred feet away from the shore. A man wearing white pants has brought a white skiff to rescue her and they seem to be negoitating as they enjoy their Newport cigarettes. The ad headline assures you that "Newport refreshes while you smoke". This ad is larger than my scanner bed so the outer edges of the ad will not be visible in the scanned view. Full color 9 1/2" x 12" ad that tries to convey just how refreshing these Menthol Cigarettes can be. The ad has a picture of a lady sitting in the back of a white skiff in the middle of a large pool of cool blue water. With the lit cigarette she is holding in her right hand she is lighting the cigarette in the mouth of a man swimming behind her. The ad headline calls it "More refreshing to begin with...more refreshing all the way". This ad is larger than my scanner bed so the outer edges of the ad will not be visible in the scanned view. Full color 9 1/2" x 12" ad for their King Size Filter Cigarettes with Light Menthol - Hint of Mint. The ad has a picture of a couple sitting on some large rocks at the edge of a large lake. The lady is in a white bathing suit and the man has white pants and a blue shirt and, while holding their lit Newport cigarettes, they are examining one of the rocks. The ad headline calls this cigarette "More refreshing to begin with...more refreshing all the way". This ad is larger than my scanner bed so the outer edges of the ad will not be visible in the scanned view. Full color 9 1/2" x 12 1/2" ad for the Cool, Freshness of Newport King Size Filter Cigarettes with a Light Menthol Hint of Mint. The ad has a picture of a beach in a tropical area where a couple are wading in from deeper water. The lady is holding a white umbrella up to protect her from the sun while the man is lighting his cigarette. The ad headline says "Newport Refreshes while you smoke". This ad is larger than my scanner bed so the outer edges of the ad will not be visible in the scanned view. Full color 10" x 13 1/2" ad for Newport cigarettes that, according to the headline, "Refreshes while you smoke". The ad shows a relaxing picture of a couple swimming in the water. The man is wearing a bathing suit and is sitting with a towel around his neck on the rocks as he enjoys a Newport cigarette from the pack in his hands. His lady, standing nearby in pants and a shirt, is also enjoying a Newport as she is discussing something with him. The ad tells us that the "Coolness of Menthol, Refreshing hint of mint, Finest quality of tobaccos" can be found in this cigarette. Full color 9 1/2" x 12 1/2" ad for their Light Menthol Hint of Mint King Size Filter Cigarettes. We have another picture of a couple smoking their Newports and taking it easy on some rocks overlooking the everpresent blue-green body of water. We are told that this product "Refreshes while you smoke" and that it has the "Coolness of Menthol", the "Refreshing hint of mint" and is made from the "Finest quality tobaccos". Full color 9 1/2" x 12" ad for their King Size Filter Cigarettes. The ad has a photo of a small sailboat tied to some rocks in the water. There are a man and a lady lying on the boat smoking their cigarettes while another lady splashes furiously in the water. The ad headline states "Newport Filter Cigarettes. Refreshes while you smoke". This ad is larger than my scanner bed so the outer edges of the ad will not be visible in the scanned view. Full color 9 1/2" x 12" ad for their King Size Filter Cigarettes with a Light Menthol Hint of Mint. This ad is a continuation of another ad from 1963. The other ad had a man and a woman in bathing suits lying on a small white sailboat without a sail while another lady splashed about in the water. In this ad the two people are still on the boat, same bathing suits and all, but the other lady is not there. I don't know if a shark had a grip on her or what but she is gone and the man looks a lot happier now that he just has one to worry about. The ad headline claims that Newport "Refreshes while you smoke". This ad is larger than my scanner bed so the outer edges of the ad will not be visible in the scanned view. Full color 9 1/2" x 13" ad for their King Size Light Menthol - Hint of Mist Filter Cigarettes. We see a couple sitting on some rocks that ring a body of water that is colored closely to what the Newport packages are and they are resting and smoking their Newports. The man, in his bathing suit, is holding the pack (waterproof pockets in his suit) and they are casting meaningful glances at each other. The ad claims that this brand "Refreshes whily you smoke" due to "Coolness of Menthol, Refreshing hint of mint, Finest quality tobaccos". Full color 9 1/2" x 12 1/2" ad for their Filter Cigarette. The ad has an overhead view of a couple in a white rowboat. The man, in a dark bathing suit, is rowing furiously with a Newport clenched between his lips while the lady, clad in a blue one-piece suit and a blue and white striped shirt, sits on the bow with a lit Newport in her hand and her feet splashing in the water. The ad headline, as usual, claims that "Newport filter cigarettes Refreshes while you smoke". This ad is larger than my scanner bed so the outer edges of the ad will not be visible in the scanned view. Full color 9 1/2" x 12" ad for their Filter Cigarettes. The ad has a close-up photo of a couple spending intimate time outdoors with nothing seperating them other than a lit Newport and a pair of sunglasses. The headline claims that "Newport smokes fresher!" and further states that it is "The only cigarette with a fine white filter, menthol and mint, and great-tasting tobaccos...fresher than any other menthol cigarette". Full color 9 1/4" x 12" ad has a photo of a couple sitting on a sailboat and sharing from a pack of Newport. From their ads it seems like, in the mid '60s at least, you couldn't enjoy a Newport unless you were on a sailboat. The ad headline makes the claim that "Newport smokes fresher!" and the text clarifies "Fresher than any other menthol cigarette". Full color 9 1/2" x 13" ad for their Fresher, Menthol Cigarette. There is a close-up photo of a couple that are probably at the beach as evidenced by the beads of water on the woman's face. She is smiling and the man, further back in the picture, is holding a lit Newport between his lips as the headline reminds us that "Newport smokes fresher!". The text tells us that it is available in either a Pack or a Box and that it comes "with a fine white filter, menthol and mint, and great-tasting tobaccos". This ad is larger than my scanner bed so the outer edges of the ad will not be visible in the scanned view. Full color 9 1/2" x 12" ad has a photo of a man and a woman on a sailboat smoking as they begin to get friendly. The ad headline claims that "Newport smokes fresher!". This ad is larger than my scanner bed so the outer edges of the ad will not be visible in the scanned view. Full color 9 1/2" x 12" ad has a photo of a handsome man lying next to the pool, smiling and smoking a Newport cigarette. In front of him is the shadow of what looks like a lady standing over him smoking her own cigarette. 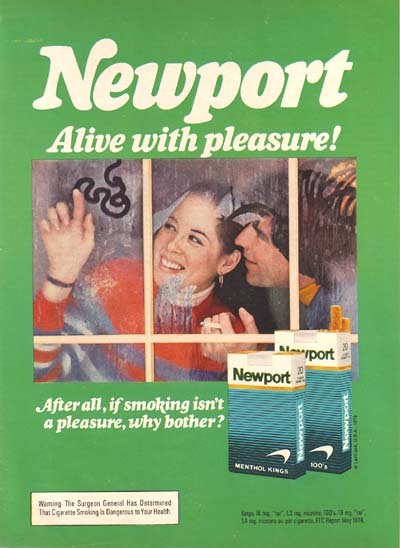 The ad headline claims that "Newport smokes fresher!...and tastes better than any other menthol cigarette. The only cigarette with a fine white filter, menthol and mint, and great-tasting tobaccos." This ad is larger than my scanner bed so the outer edges of the ad will not be visible in the scanned view. Full color 9 1/2" x 12" ad for their King Size Filter Cigarettes. There is a picture of a lady lying on the sand as her husband wades in the surf a few feet away. The ad headline claims that "Newport's mild menthol is so tender to your taste" and the text explains that using natural menthol is the secret to being smooth. This ad is larger than my scanner bed so the outer edges of the ad will not be visible in the scanned view. Full color 10" x 13" ad that wonders if you are "Ready to try a great, fresh taste?" We see a closeup of a man and a woman, the man is smoking a Newport cigarette and the woman probably is but you just can't see it because just their heads are visible in the photo. The headline says that "Newport tastes fresher!" and further down in the ad it states "and tastes better than any other menthol cigarette!" Full color 9 1/2" x 12" ad has a photo of a lady with wet hair on a sailboat being offered a Newport King Size Mild Menthol Cigarette from a male hand coming in from off-camera. The ad headline asks the question Ready to try a great, fresh taste? and informs us that "Newport tastes fresher". This ad is larger than my scanner bed so the outer edges of the ad will not be visible in the scanned view. Full color 9 1/2" x 13" ad for their King Size Filter Cigarettes with Mild Menthol. The ad has a picture of a man who is in a swimming pool and he has come to the edge for a break. A woman with dark hair is there waiting for him and has given him a Newport cigarette which she is in the process of lighting for him from a box of matches she holds in her hands. The ad headline asks if you are "Ready to try a great fresh taste?" and lets you know that "Newport tastes fresher". This ad is larger than my scanner bed so the outer edges of the ad will not be visible in the scanned view. Full color 9" x 13" ad for their King Size Mild Menthol Filter Cigarettes. This ad, another in their Shadow series, has a picture of a man who has been swimming in a pool and has come to the side and is resting as he smokes a Newport and looks up at someone out of the picture. The shadow on the ground indicates it is a female who is standing with her hands on her hips as an opened pack of Newport with one cigarette extended lays on the towel in front of him and at the edge of her shadow. The headline asks if you are "Ready to try a great, fresh taste?" and replies that "Newport tastes fresher!". It continues at the bottom of the ad "and tastes better than any other menthol cigarette!". Full color 9 1/4" x 12" ad for their King Size Mild Menthol Cigarettes. The ad has a picture of two couples, sitting on a cement wall in their bathing suits, who are enjoying their cigarettes as they relax after a swim. The ad headline asks the question "Ready to try a great, fresh taste"? and answers with the response that "Newport tastes fresher!". This ad is larger than my scanner bed so the outer edges of the ad will not be visible in the scanned view. Full color 9 1/2" x 13" ad for their King Size Mild Menthol Cigarettes. The ad has a picture of a clear summer day where a couple is enjoying the sunshine by sailing on their boat. The lady, in her normal blue and white striped shirt, is holding onto the ropes with both hands as the man sits calmly and smokes his Newport. The ad asks the question "Ready to try a great, fresh taste" and answers with the promise that "Newport tastes fresher!". Full color 9 1/2" x 12" ad has a photo of a happy couple enjoying a sunny day on a sailboat. The ad headline asks "Ready to try a great, fresh taste?" This ad is larger than my scanner bed so the outer edges of the ad will not be visible in the scanned view. Full color 9 1/2" x 12 1/2" ad for their Menthol Cigarette. The ad has a picture of a pack of cigarettes, lying on it's side, with a photo of a couple enjoying a day on their sailboat visible through the pack. The ad headline claims that "Day after day...Newport is the smoothest tasting menthol cigarette...always smooth and refreshing, never tastes harsh or rough". This ad is larger than my scanner bed so the outer edges of the ad will not be visible in the scanned view. Full color 9 1/2" x 13" ad for their Menthol Cigarettes. The ad has a large picture of a hardy-looking man squinting as he looks at something while he stands with a gently, rolling body of water behind him, with nothing but water all the way to the horizon. The ad claims that Newport has "Menthol-chilled...remarkably refreshing taste". It also claims that "Like the sea, Newport keeps inviting you back". Full color 7 1/2" x 10 1/2" ad for their Menthol Filter cigarettes. Pictured is a seafaring man leaning into the camera with a lit Newport between two fingers, several layers of clothing and a stocking cap on, the sea at his background and the words "Welcome aboard" from his lips. These are claimed to have a "Menthol-chilled remarkably refreshing taste" and a green and white Crush-Proof box is shown in the ad. Full color 7 3/4" x 10 1/2" ad for their Menthol Cigarettes. The picture in the ad shows a hardy man smiling at the camera as he sits on his boat and holds a lit Newport inches away from his lips. The caption has him saying "Welcome aboard" and the text claims they are "menthol-chilled" with "remarkably refreshing taste". Full color 7 3/4" x 10 3/4" ad for their Menthol Cigarettes. With the normal green background there is a picture of a happy couple sitting on a sidewalk next to some water with a variety of buildings in the background, just past the trees. 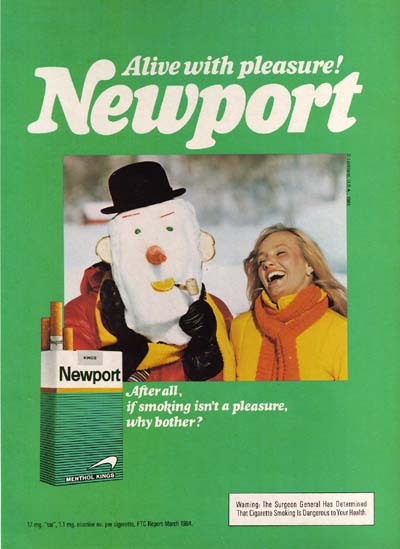 The people are talking and smiling as they enjoy their Newport cigarettes which, according to the ad, are "Alive with pleasure." The logic is presented that "After all, if smoking isn't a pleasure, why bother?" Full color 7 1/4" x 10 1/4" ad for their Newport Lights. The ad has a picture that shows an opened pack of these cigarettes sitting in an open window that gives a view of a choppy lake and the sun partially hidden behind some white clouds. The ad headline tells you to "Lighten up!" Full color 7 1/2" x 10 1/2" ad shows a couple drawing squiggles on the frost of a wintry window as they enjoy their Newport cigarettes. The ad headline says "Newport - Alive with pleasure!". Full color 7 1/4" x 10 1/4" ad for their Menthol King Cigarettes. Under the headline "Alive with pleasure! Newport" is a picture of a man on skies wearing a red coat and a surprised look as an attractive blonde lady tries to tackle him from behind. The ad mentions "After all, if smoking isn't a pleasure, why bother?". Full color 7 3/4" x 10 1/4" ad for their Menthol Cigarettes. The ad has a photo of a person wearing a white fencing outfit, complete with a mask, holding two laughing ladies. The ad headline says "Alive with pleasure! Newport". Full color 7 1/2" x 10 1/2" ad shows a laughing lady standing next to a snowman with a fruity face. The ad headline claims "Alive with pleasure! Newport". Full color 7 1/2" x 10 3/4" ad for one of the ideals of this brand of cigarettes, the Newport Box. There is a photo of two couples sitting together, singing and playing an accordian. The headline says that it is "Alive with pleasure" and the text, right next to a photo of boxes of two different sizes says, "After all, if smoking isn't a pleasure, why bother?" Full color 7 1/2" x 10 1/2" ad for their Newport 25s available as Kings or 100s. There is a happy picture of two couples playing what looks like a game of Musical Chairs on an area overlooking a body of water. The headline next to a picture of one of these packs promises "More pleasure per pack!". Full color 9" x 11" ad for their Regular and Menthol cigarettes. The ad has a photo of a couple lying in the grass laughing as they play in the leaves that have turned and fallen from the trees as part of the Autumn ritual. The ad headline says "Newport - Alive with pleasure!". This ad is larger than my scanner bed so the outer edges of the ad will not be visible in the scanned view. Full color 9 1/4" x 11 1/4" ad that features a photo of a lady turning a man's jeans into a pair of shorts while he is wearing them. He seems to have a look of nervous humor on his face as she wields her scissors on the second pant leg. The ad headline says "Alive with Pleasure! Newport". This ad is wider than my scanner bed so the outer edges of the ad will not be visible in the scanned view. Full color 9" x 11 1/2" ad for their Menthol King Cigarettes. We see a picture of a man pretending to play a piano as two attractive ladies sit on the top of it and dangle their toes onto the keys. The headline shouts "Newport pleasure!" and there is a picture of an opened pack in the lower right hand corner.